Mangaluru, May 18, 2015: Vehicles were stranded on Charmadi Ghat on May 17, Sunday after a lorry broke down in the middle of the road. Charmadi Ghat is the key alternative routes for movement of vehicles between Mangaluru and Bengaluru, following the closure of Shiradi Ghat. As a result, the traffic was disrupted for hours. 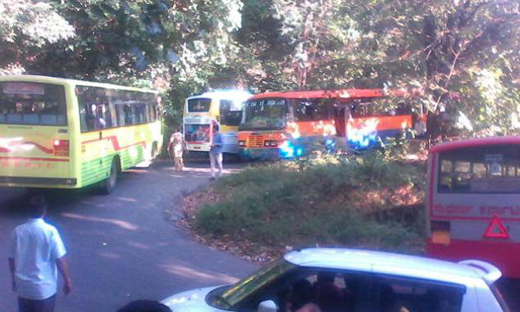 The plying of vehicles on the Charmadi Ghat has also increased following summer vacation. A KSRTC bus drivers said that it is scary matter to drive the vehicle on the Ghat section during weekends. Small vehicles which come from all sides, do not move in a systematic way and give room. The government should repair the Shiradi Ghat stretch at the earliest to avoid traffic chaos and a serious situation on the Charmadi Ghat.